พ.ศ. 2538 คณะกรรมการชมรมฯได้หารือกันเพื่อยกฐานะขององค์กร จากชมรม มาเป็นสมาคม เพื่อรองรับกิจกรรมที่มีมากขึ้น จึงได้ขออนุญาตให้จัดตั้งเป็นสมาคมการค้าและได้รับใบอนุญาตสมาคมเมื่อวันที่ 14 กันยายน 2538 ใช้ชื่อ "สมาคมผู้ผลิตและส่งออกน้ำยางข้นไทย" มีนายถาวร เรืองวรุณวัฒนา ประธาน บริษัท ถาวรอุตสาหกรรมยางพารา (1982) จำกัด ดำรงตำแหน่งเป็นนายกสมาคมฯเป็นคนแรก ได้ใช้สำนักงานของ บริษัทถาวรอุตสาหกรรมยางพารา (1982) จำกัด เป็นที่ทำงานชั่วคราว ต่อมาเมื่อวันที่ 1 สิงหาคม 2547 ได้รับการอนุเคราะห์สถานที่จากสมาคมยางพาราไทยเป็นสำนักงาน เมื่อวันที่ 2 กันยายน 2547 ได้จดทะเบียนเปลี่ยนชื่อเป็น "สมาคมน้ำยางข้นไทย"
Thai rubber entrepreneurs have expanded investment for producing latex additionally a lot according to the requirement of world market which is increasing because there are problems of “AIDS” diseases. Later, about the middle of the year 1987, Thai latex producers had problems on export tax and duty to deliver latex abroad as the government collected tax in the rate which was higher than competitor countries causing entrepreneurs to be unable to compete with competitor countries. Latex manufacturer group, joining with Chamber of Commerce, proposed such problems to the government of HE Gen. Prem Tinsulanonda for acknowledgement. Later, Mr. Pramuan Sapawasu, Minister of Industry traveled to the area to know the problems from entrepreneurs in manufacturing latex in Nabon District, Nakhon Si Thammarat Province on 14 August 1987 and on 21 August 1987, latex producer entrepreneurs proposed a letter claiming about such trouble to the government through Chamber of Commerce of Nakhon Si Thammarat Province. On 28 October 1987, the government approved for solving problems, by assigning Office of Board of Investment (BOI) and Ministry of Industry to approve for exemption to collect export tax, to latex producers for one year, (formerly export tax rate was 30% of sales price;) so they could compete with competitor countries. On 28 January 1988, Concentrated Latex Producer Entrepreneur Group, led by Mr. Yos Phanpiphat, Chairman of Nabon Rubber and Latex Co., Ltd. and Group of Companies, held a meeting jointly at Thai Hotel, Mueang District, Nakhon Si Thammarat Province. The group aimed to see the necessity of joining together of entrepreneurs to help members in the group. Therefore, the group had unanimous resolution to set up “Latex Producer Club of Thailand” and the club was registered on 28 January 1988. There were all five founder companies, Thai Rubber Latex Corporation (Thailand) Public Co., Ltd., Thavorn Rubber Industry (1982) Co., Ltd., Nabon Rubber Co., Ltd., T.T. Latex and Products Co., Ltd. and Sricharoen Latex Co., Ltd. The meeting elected Mr. Yos Phanpiphat to be the first Chairman of the Club. 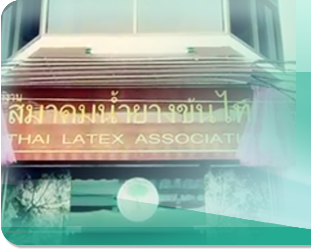 Latex Producer Club of Thailand, therefore, is the place for exchanging opinion of members on several problems as well as messages in all matters, production technique, labor, marketing, foreign countries, as well as the government’s policy on rubber. The association was established in the year 1995. The committee of the club discussed with each other to set up the status of the organization from a club to be an association, to bear increasing activities. Therefore, permission is applied to establish to be trade association and association permit was granted on 14 September 1995. It used the name: “Thai Concentrated Latex Producers and Exporters Association”. Mr. Tavorn Ruangwarunwattana, Chairman, Tavorn Rubber Industry (1982) Co., Ltd., to be in the capacity of Chairman of the Association, the first chairman. It used the office of Tavorn Rubber Industry (1982) Co., Ltd., to be a temporary working place. 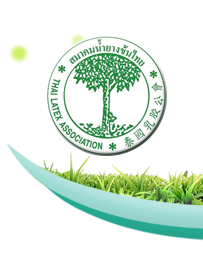 Later on 1 August 2004, it was assisted for a place from Thai Rubber Association, to be an office on 2 September2004. 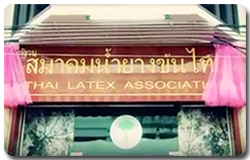 The company has registered change the name to: “Thai Latex Association”. Copyright 2006. www.tla-latex.org All rights reserved.